One of the things that hasn’t changed however, is Newton’s ability to write effortlessly successful acoustic anthems. His new album Write It On Your Skin is perched on the top of the UK charts, beating Frank Ocean’s highly anticipated album Channel Orange to the coveted number one spot. Since bursting on to the scene with Hand Built by Robots he paved the way for countless other singer songwriters such as Ed Sheeran, Ben Howard and Frank Turner to find success. 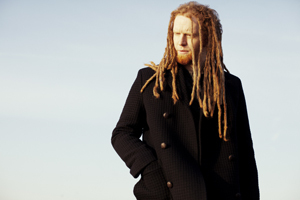 You could be forgiven for assuming that fans wouldn’t take to another album in a genre that is quickly becoming saturated, but Write It On Your Skin has shown that Newton Faulkner is still capable of rising above the rest and providing a quality album. Speaking about his success despite the competition, Faulkner said: ‘It’s been amazing and I think the competition is good for the genre.’ He goes on to explain that the musical landscape in 2009 when he released Rebuilt By Humans was not conducive to singer songwriters: ‘It was like walking into a western saloon bar where Dizzee Rascal was playing and having the music stop and everyone stare at you.’ In many ways the fact that there are so many other artists doing the same thing has allowed Faulkner to easily slip back into the public’s affections. Not that Write it On Your Skin needed any help in being recognised as a great album. Faulkner has recaptured the spirit of Hand Built By Robots with the album and it is equally as charming as the enchanting debut. He has the ability that many great songwriters have of writing songs that are simple yet incredibly catchy. His abilities are not limited to the studio either. His live shows are something to behold, with Faulkner known to include some stunning covers in his live shows, with everything from ‘Spongebob Squarepants’ to Queen’s ‘Bohemian Rhapsody’ being played. Outside of music, Faulkner has settled down and now has a one year old son, which has influenced his music for the better. When asked about having a son, he said: ‘I thought it would make me sell out more to make more money and support a family, but I realised its not just me who has to live with the songs anymore. Its made me a lot harder to work with as if I think something is right, I’ve completely stuck to it and haven’t compromised at all.’ And this can only be a good thing for his music, helping Write in Your Skin maintain its natural feel.